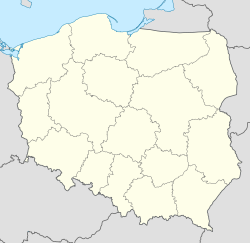 Racibórz [raˈt͡ɕibuʂ] (German: Ratibor, Czech: Ratiboř) is a toun in soothren Poland wi 60,218 indwallers (2006) situatit in the Silesian Voivodeship (syne 1999), previously in Katowice Voivodeship (1975–1998). It is the caipital o Racibórz Coonty. The name Racibórz is of Slavic origin an comes frae the name o Duke Racibor, the ceety's foonder. Wikimedia Commons haes media relatit tae Racibórz.